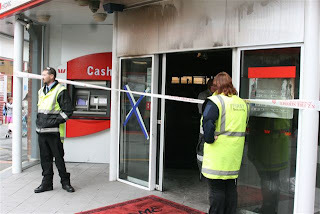 Westpac, like the other Australian-owned banks, makes hundreds of millions of dollars in profits a year, but (no surprise) can't be bothered spending a little money on fire safety. An early morning fire at Coastland’s Westpac Bank in Paraparaumu on Wednesday has been catastrophic for both the bank and surrounding businesses. The fire, which fire-fighters believe was caused by an electrical fault, has obliterated the public downstairs area in Westpac and caused extensive heat and soot damage upstairs. Next door, the Breaden McCardle Chubb Law Solicitors’ offices and the Windmill Cake Shop were extensively damaged by smoke and heat. Paraparaumu Fire Station Officer Steve Hudson says it’s thought the fire started in the centre of the Westpac bank between 1am and 2am. A bank employee said that an electrical fault may have been to blame. Because the building was closed up, with no oxygen getting in, the fire smouldered for some time before becoming an inferno. The bank did not have a fire alarm connecting it to the fire station and the only indication that something was wrong was when Police heard the bank’s burglar alarms going off. The first fire crew arrived on the scene at 2.20 am and had problems with excessive heat. First fire-fighters unable to go in inside and had to leave the building and make it safe before any fire fighters could go inside. It took 10 fire appliances, 8 pumps, two special fire appliances from Wellington and Avalon — and 40 fire-fighters to get the blaze under control. Mr Hudson says it is “highly recommended” buildings have an alarm attached to their sprinkler systems, thus notifying the fire station early that there was a fire.